Proprietary Name: Cover Fx Spf 30 Booster Drops Broad Spectrum Sunscreen What is the Proprietary Name? Non-Proprietary Name: Avobenzone, Homosalate, Octisalate, Octocrylene What is the Non-Proprietary Name? 68327 - Cover Fx Skin Care Inc.
Cover Fx Spf 30 Booster Drops Broad Spectrum Sunscreen with NDC 68327-074 is a a human over the counter drug product labeled by Cover Fx Skin Care Inc.. The generic name of Cover Fx Spf 30 Booster Drops Broad Spectrum Sunscreen is avobenzone, homosalate, octisalate, octocrylene. The product's dosage form is oil and is administered via topical form. 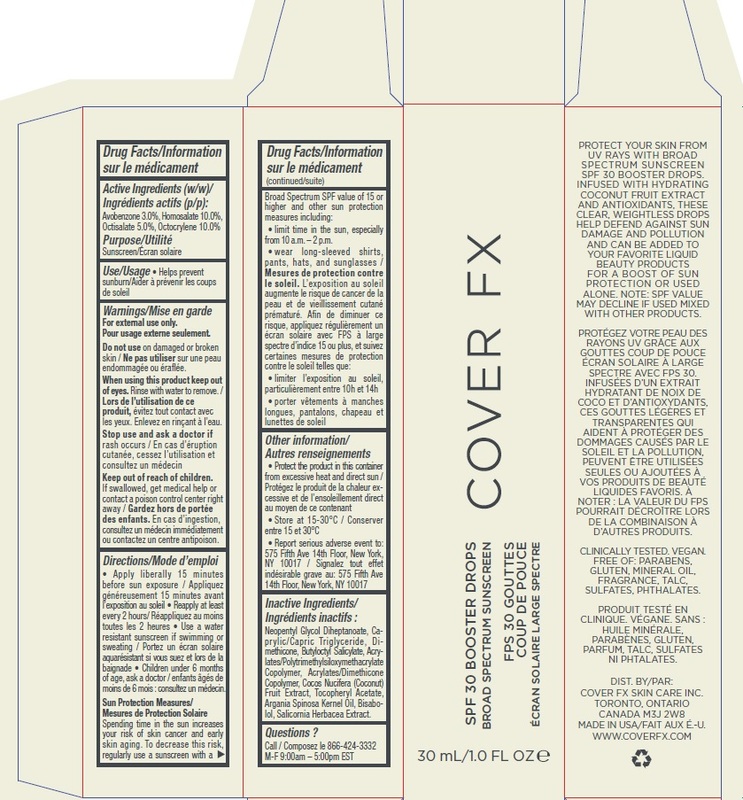 Labeler Name: Cover Fx Skin Care Inc.
Limit time in the sun, especially from 10 a.m.-2 p.m.wear long-sleeved shirts, pants, hats and sunglasses. Neopentyl Glycol Diheptanoate, Caprylic/Capric Triglyceride, Dimethicone, Butyloctyl Salicylate, Acrylates/Polytrimethylsiloxymethacrylate Copolymer, Acrylates/Dimethicone Copolymer, Cocos Nucifera (Coconut) Fruit Extract, Tocopheryl Acetate, Argania Spinosa Kernel Oil, Bisabolol, Salicornia Herbacea Extract.